Place all the ingredients in a deep dish with a lid and mix with a wooden spoon. Keep this mixture in a cool dry spot. 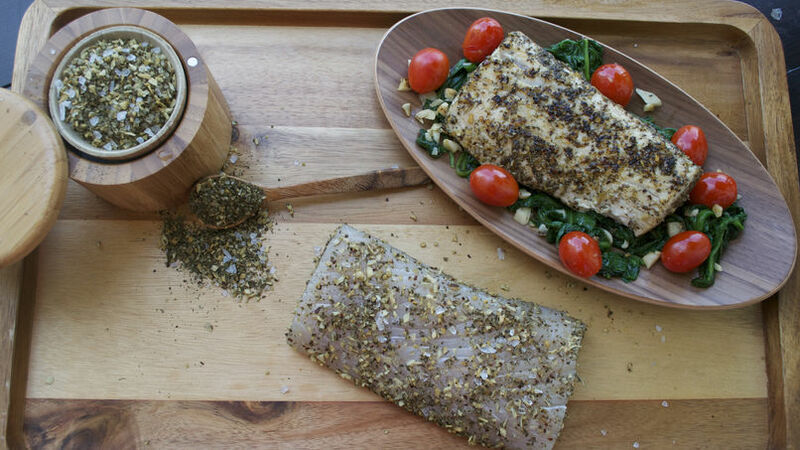 To season your fish with this delicious rub, spread a bit of the mixture on a flat dish and rub into the fish with your hands, covering it completely. Cook in the oven or the grill, or simply sauté with a bit of oil in a nonstick pan. Don’t use wet spoons in the rub. Use dry spoons to prevent adding moisture and wasting the rub. Besides parsley and dill, you can add your favorite herbs and spices. Martha Salas Cooking is an art. Turning into the artist that creates your dishes is simple all you need is a little imagination and creativity. The most important thing is to use high quality ingredients in your recipes because they will be the key tools in creating your masterpiece. The seasoning, herbs, spices and sauces make your dishes unique and have your personal touch. If you’re the kind of person that likes to mix spices and aromatic herbs to give your meals flavor, then you’re just right to prepare this spectacular rub, perfect for seasoning fish and shrimp. Let’s keep the secret between us though, because the real creator is my husband. You’ll see that your fish and shrimp will be juicy, delicious and an aromatic touch; just mix spices and ground herbs. That’s what a rub is: a thick ground mixture to spread on raw foods to then be grilled, baked or sautéed, but not boiled. You can add crushed garlic, thick salt and sugar to let it caramelize. This is where you add your creativity and personality.